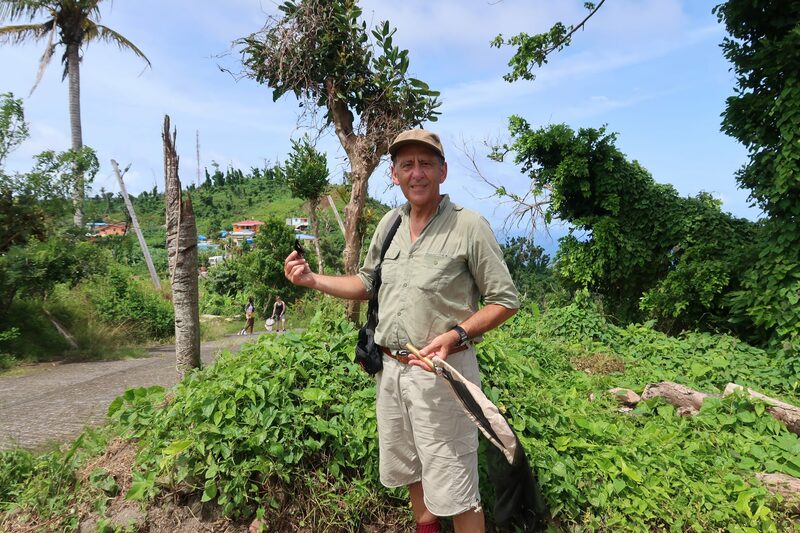 The Swallowtail and Birdwing Butterfly Trust, through its cooperation agreement with Operation Wallacea, was able to undertake a survey of the butterflies of the Lesser Antilles Caribbean island of Dominica, enlisting butterfly specialist and SBBT Associate Clive Huggins to carry out the work during a visit to the island in July 2018. 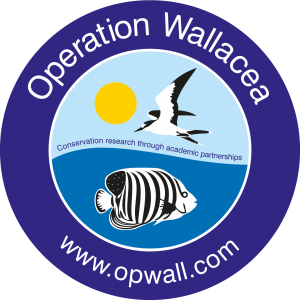 Operation Wallacea had undertaken biodiversity surveys on the island for the previous four years, but no check on Lepidoptera had been possible in the previous entomological surveys, so Clive was a welcome addition to the project’s Terrestrial Research and Education Team. Clive undertook a survey of the island’s butterfly fauna, the first for many years, with a special check on the endemic subspecies of the Polydamas swallowtail. He also contributed to records of other insect groups already accumulating from the project and being studied in cooperation with expert entomologists at London’s Natural History Museum. Dominica’s butterfly list records fifty-five species, two of which, the Dominican hairstreak Electrostrymon dominicana and the Dominican snout Libytheana fulvescens, are endemic. In addition, and of particular interest to SBBT, is the endemic subspecies of the Polydamas swallowtail, Battus polydamas dominicus, the only papilionid known to occur there. The Polydamas swallowtail, also known as the Gold-rim or Tail-less swallowtail, is widespread across the Caribbean and Latin America and is not presently known to be under threat anywhere within its range. Unusually for a Caribbean butterfly, it has 14 subspecies in the region, showing wing marking variation between many of the islands. The genus Battus, which occurs across North and South America and the Caribbean, is part of the tribe Troidini and is therefore closely related to the birdwing swallowtails, which mostly occur in southeast Asia. In common with the birdwings, Battus larvae feed on vines, typically Aristolochia. Its foodplant in Dominica has not been formally recorded but in other areas around the Caribbean, it is known to feed on various species of Aristolochia. September 2017’s hurricane “Maria” was the first Category 5 storm on record to hit Dominica, causing devastation in most areas of the island. In addition to the terrible impact on the island’s inhabitants and their livelihoods, the island’s magnificent forests were significantly altered, with tree-falls opening up the canopy and allowing a dense undergrowth to develop, with vines rapidly climbing the remaining trees. Most trees were damaged by the storm. If not toppled, they lost branches and some still standing died through being stripped of branches and leaves. Where there are no living trees and their roots to hold slopes together, the island has become vulnerable to landslides and the forest will take many years to return to its former mature state. The Terrestrial Research and Education Team was based in a forest site at the Three Rivers Eco Lodge that had been cut off from other parts of the island when the bridge over the river on whose banks the lodge stood was destroyed by the hurricane. As a result, the team started each day by wading across a river to reach a road for access to other parts of the island. Clive found that the endemic swallowtail Battus polydamas dominicus was more widespread than expected, being seen on east and west coasts plus several inland locations. The species did not appear to have suffered unduly from the hurricane as was found to be the case with both birds and bats. Indeed, the profusion of vines growing along edges of the newly opened forest canopy may well have brought benefits to the butterfly. B.polydamas was photographed in the wild, where it has a strong flight and frequently displays territorial behaviour, most often seen in or near habitat of mixed plantation. The Polydamas swallowtail can reproduce with continuous generations throughout the year. Much useful data will be provided to the Dominican Forestry Department and for the Natural History Museum in London, where further reports are in preparation.